Where the Darkness Hides picks up immediately where Within the Dark Places ended - and, as tradition dictates for horror sequels, this time the body count is higher and the death scenes are even more brutal and terrifying. The shadowmen have returned. This time, they lay siege to Raven's Peak police station, and amongst the hostages is Joe Costello. However, the shadowmen are not the only threat; as Joe steps out of the shadows to do battle with the forces of evil once more, he finds something even more sinister lurking where the darkness hides. 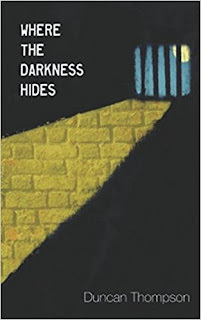 As is mentioned above, Where The Darkness Hides takes place immediately following where Within The Dark Places ended. Joe Costello is back after his first fight with the shadowmen but this time, not only has he got to fight the shadowmen once more, he also has to contend with a police officer who wants answers to what happened in Druid Woods. I won't go into too much detail as to what happened in those woods as that would spoil this book and its predecessor if you haven't read them. I will say that this is an excellent follow up and as is the law to horror sequels whether its in film or book format, the body count is higher. Thompson clearly has an idea of where he wants his characters to go and with an ending that screams 'more to come', maybe it's time you got caught up with what happens in the quiet town of Raven's Peak.